Home » Our Doctors » Greg Hunter, O.D. Dr. Gregory W. Hunter passed away on June 9, 2014 with his family by his side. He was born November 11, 1946 in Indianapolis, IN. He grew up in Miami, FL. He spent most of his life working in Orange Park, FL. 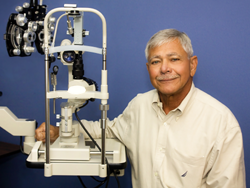 Dr. Hunter attended University of Miami and graduated from Southern College of Optometry in 1969. He dedicated 45 years to stomping out blindness as a family optometrist. He touched the lives of everyone he encountered. He volunteered for multiple organizations throughout his life. He lived life to the fullest with many hobbies, surfing fishing, and golfing are just a few. More than anything he enjoyed spending time with his family. He truly loved his Orange Park patient base and will be dearly missed by all. We are privileged to have had the opportunity to work with him and carry on his legacy of patient care.